Protect that moneymaker of a face that you have with the RevGear Champion Headgear! The Revgear Champion headgear protects every part of your head without making you feel constricted or hindering your vision while training. 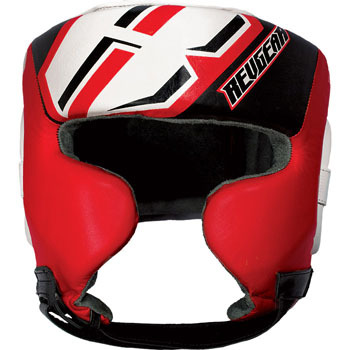 This headgear has extra high performance padding on the top of the head to protect from elbows and overhand strikes. Special Formfit™ cheek protection on the headgear is designed to maintain maximum visibility. All leather, worn in feel, durable construction and soft micro suede inner lining to prevent shifting or moving while sparring. Fully adjustable hook and loop closure chin strap and opposing back straps keep headgear in place. Top lace strap provides extra fit to your head. Sold as each. The RevGear Champion Headgear is available at MMA Warehouse.